The former nurse of physicist Stephen Hawking has been struck off the nursing register for failures in care. The Nursing and Midwifery Council (NMC) said Patricia Dowdy 'failed to provide the standards of good, professional care' that it expected and that professor Hawking deserved. 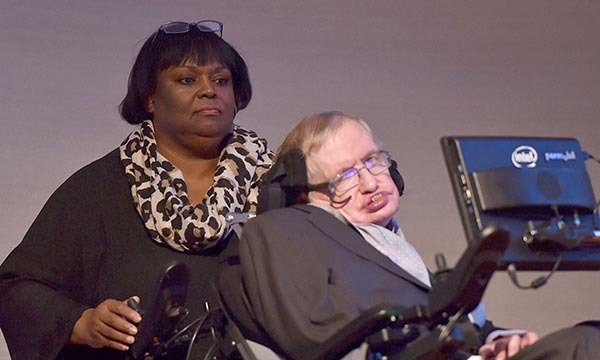 Ms Dowdy, who was with Professor Hawking between 1999 and 2004 and re-employed from July 2013, was given an interim suspension in March 2016. She faced multiple misconduct charges in a fitness to practise hearing relating to the care of the scientist, who died in March 2018 aged 76. The NMC said the charges included financial misconduct, dishonesty, failure to provide appropriate care, failure to cooperate with the regulator, and not having the correct qualifications. Neither Ms Dowdy nor her solicitor, Ian Persaud, attended the hearing, which began in February. It was held behind closed doors, a decision which has attracted criticism. NMC chief executive Andrea Sutcliffe said on Monday that hearings were sometimes held in private to keep information confidential. 'That is the basis upon which this particular hearing was conducted in private and I stand by that decision,' she wrote in a blog. NMC Matthew McClelland said: 'As the public rightly expects, in serious cases such as this – where a nurse has failed in their duty of care and has not been able to evidence to the panel that they have learned from their mistakes and be fit to practise – we will take action.